How often have you heard this at the drop zone? Tracking dives are increasingly popular at any drop zone in the world, and with good reason: They’re a ton of fun! But they are most definitely not just another skydive; they have a high potential to interfere with other groups exiting the aircraft if certain precautions are not followed. Here are some things to keep in mind to make your tracking dive a safe, awesome experience. Should you be doing a tracking dive at all? The size of the tracking dive should be commensurate with your experience. If you wouldn’t do a belly fly or freefly jump with the number of people on the tracking dive, you shouldn’t track with them either. Lower-experienced jumpers have a greater chance of not being able to stay with a big group and tracking away from that group early, potentially into another group. Get approval for your tracking dive. The dive leader needs to get approval from operations staff (pilot, DZ manager, etc.) for every single tracking dive. This is especially critical if we are running multiple aircraft simultaneously (as occurs pretty much every weekend), which may or may not be following the same jump runs all day. Who’s in charge? The person leading the dive should be familiar with the drop zone, the direction of jump run, the day’s winds, and the experience and capabilities of each person on the jump. This person should also have the confidence to let people know if they should not be on that skydive, and perhaps start with a smaller tracking dive first. The leader also needs to brief everyone on safe flight techniques. Communicate with the rest of the load: The leader must know what other groups are on that load and what they’re doing. Also, everyone on the plane must know what you’re doing so they can keep an eye out for you. 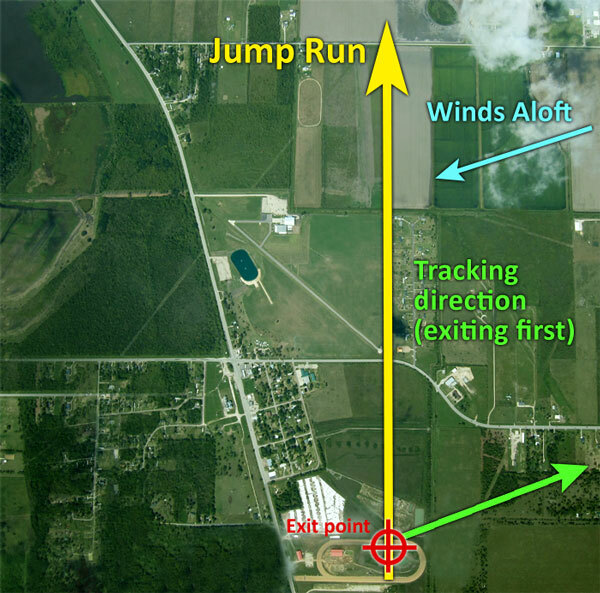 When you do a tracking dive, you are intentionally going far and fast away from the spot of air your group would occupy if you weren’t tracking. Given the slower (usually) fall rate of a tracking group, it is very easy for a fast group to cover a mile or more across the ground. If you aren’t careful to take your group away from jump run, you can easily end up above or below other groups and put quite a few people in harm’s way. Time of day: A good spot is critical for last load of the day, since recovering people from off landings in the dark is no one’s idea of fun. During the track: The leader must maintain awareness of the group’s location and flight skill, and be able to adjust his flight angle/speed to keep the group together and moving in a safe direction. Course corrections: Particularly if the leader is tracking on his/her back, their visuals of ground references may be compromised. Highly experienced jumpers in the group can and should give course corrections if needed to maintain safety of the group (distance from jump run and spot). Landing off: Your chances of landing off are much higher on a tracking dive. In fact, one of the toughest things to manage on a tracking dive is maintaining a safe distance from other groups on the jump run while also keeping a good chance of landing at the DZ. When in doubt, though, stay further from jump run! Landing off is something most of us have done successfully, while a freefall or canopy collision is much less likely to end well. Remember to look at any wind indicators you can find, pick a large, clear area early, and be prepared to do a parachute landing fall if necessary.